With a secure foundation in place to manage internal IT, many IT leaders are thinking about a foundation for the entire business. In the new world of mobile apps, cloud services, and the Internet of Everything, people, processes, data, and devices are all converging to reshape how day-to-day business is done. Companies are reaching out to customers and partners—and even intelligent objects like connected cars and monitoring systems—and modifying the products and services they bring to market as a result. To an unprecedented degree, the future of an enterprise lies in the hands of the CIO and her IT staff who orchestrate these connections and act on the benefits they bring. IT leaders are finding new opportunities in an era of digital disruption. 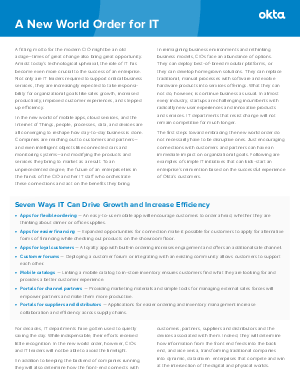 This executive brief provides a quick overview of how they are driving growth and increasing efficiency by securely connecting the digital enterprise with customers, partners, suppliers and distributors.